I bought a Flip over ice hut and runners. Should I build a smitty as well? The devil is that, Brian. Runners don't help with the hand pulling. They are for protecting the tub if you're pulling over concrete on the road or pulling behind a machine on ice. You want a Smitty sled to lift your hut off the snow so it's not plowing it while you're hand pulling. Less friction. Yes build one. No doubt. Any Garmin Panoptix fans out there? Got freaked out for a second but nope, I bought fish crisp. It's spring and there are a ton of carp in the shallows now. Great opportunity to try out fishing for those large goldfish. Just some corn on a hook will do, they seem to be in quite the feeding mood. We grabbed some random rods and went at it. We even used the same rods later that evening for walleye. Have a gander and enjoy the video. Lol. Nice job Brian and Terry! Fished rice. It was pretty stellar. Hey Ryan, great video. Amazing. I don't post much anymore but it's been fun seeing your posts and watching Averie grow up. I wish you all the best in this new adventure! 1. 2. 3.I don't have the new fuel yet. Glad it helps. 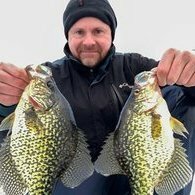 If you ice fish, you need electronics! Fishing blind isn't the same. Thanks Joeytier... We just got a dumping of snow, so this coming weekend (which is a good chance of being our last) won't be so walker friendly.